(07) 5527 3719 CALL US NOW! Is there a Life after a DUI? Approximately 30% of fatal crashes in Australia are caused by drink driving. According to the Centre for Accident Research and Road Safety Queensland, over 1 in 4 drivers and riders killed on Australian roads have a BAC exceeding the legal limit. 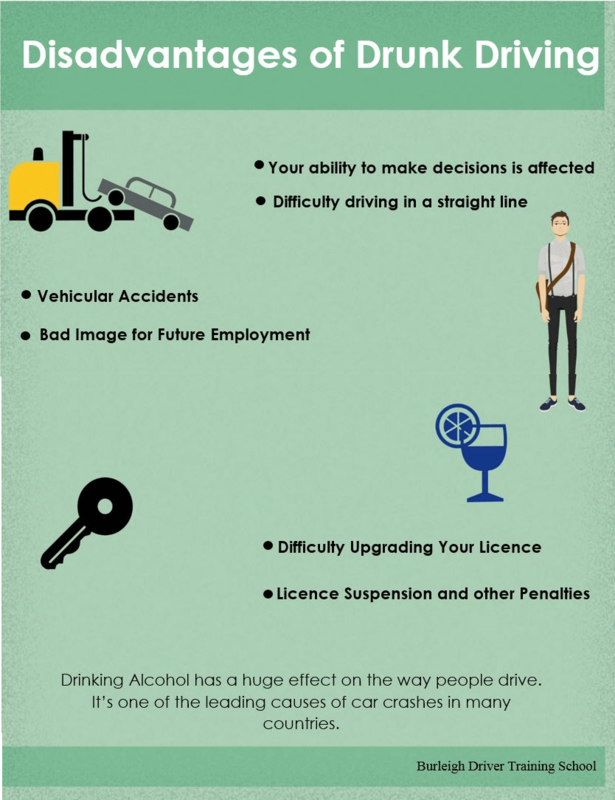 In case you do not know the four alcohol limits in Queensland, our Driving School Queensland will walk you through it. These said limits are being used to apply penalties when you are caught driving under the influence of an illegal blood or breath alcohol concentration (BAC) for your licence. If the alcohol concentration in your breath or blood is more than zero, you will be over this limit. This is the limit that applies when driving a truck or on your P’s. Drivers must have a zero-alcohol content. If the alcohol concentration in your breath or blood is equal to or more than 0.05, you will be over this limit. This limit is for cars, and open licence holders. If the alcohol concentration in your breath or blood is equal to or more than 0.10, you will be over this limit. If the alcohol concentration in your breath or blood is equal to or more than 0.15, you will be over this limit. There are many campaigns about the bad effects of drunk driving. Alcohol is considered to be a drug depressant as it impairs your vision and slows down the activity of your central nervous system causing your brain to be sluggish. Being a truck driver requires extreme focus and alertness because they usually spend long stretches of time driving on their own. They have the sole responsibility for assuring the safety of their vehicles and the people they share the road with. So how does alcohol affect driving? Slowing down your reaction time and affecting your ability to make right decisions. You will find it hard driving on various road conditions such as straight line, curve line and road under construction. It will also reduce your ability to notice road hazards. Previously, our Driving School Queensland emphasized that drunk driving causes a higher risk of vehicular accident as it reduces your attention span. Thus, you won’t be able to notice other drivers or vehicles. If you are planning to upgrade your licence and look for a better paying job, the DUI that was charged to you will surely affect your future employment. Expect some penalties when caught driving under the influence of alcohol. The penalty will depend on your alcohol intake and your BAC history. Since your vision is affected, you will find it hard to obey road rules. It can affect your psychomotor skills causing confusion and poor vehicle coordination. Drunk drivers are more prone to road accidents, thus causing emotional distress and long-time effects to the victims. DUI resonates financial loss. Fines and penalties are the immediate impacts. In worst cases, drunk driving can cause physical impairment and death. So if you are still wondering that drunk driving has an effect to everyone? Our Driving School Queensland will definitely say ‘YES’ to this. You should never risk driving under the influence of alcohol. Stay Safe, Drivers! This Infographic presentation was designed to remind every driver about the bad effects of drunk driving. Burleigh Driver Training School cares about your safety. Do you know some tips on how to avoid drunk driving? Share your comments below. Want a truck licence or a licence upgrade? Get yours here! Burleigh Driver Training School provides a wide range of truck driving training, day courses and comprehensive truck licence training on Gold Coast. We offer extensive driver training for heavy vehicle (HR) Licence in Brisbane, Tweed Heads, Queensland, including northern New South Wales regions.